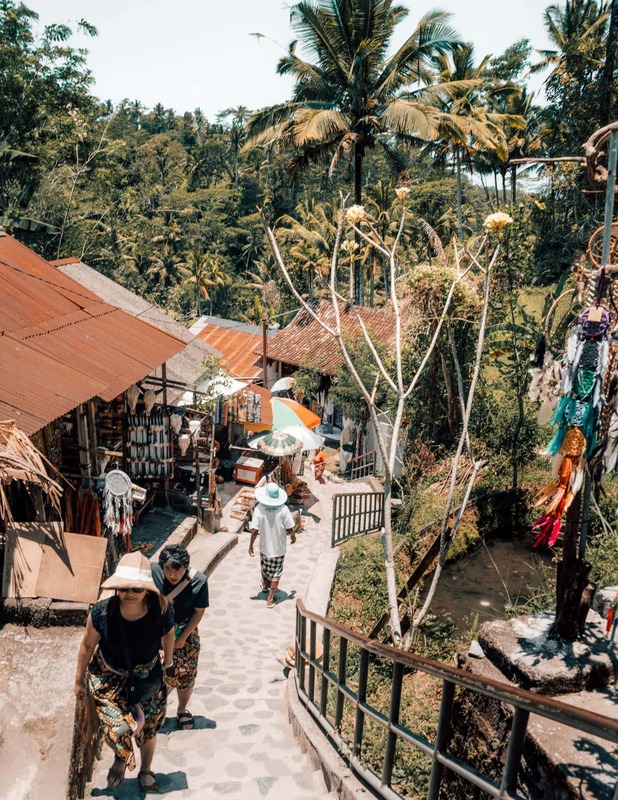 Ubud is a popular art village in the center of Bali. 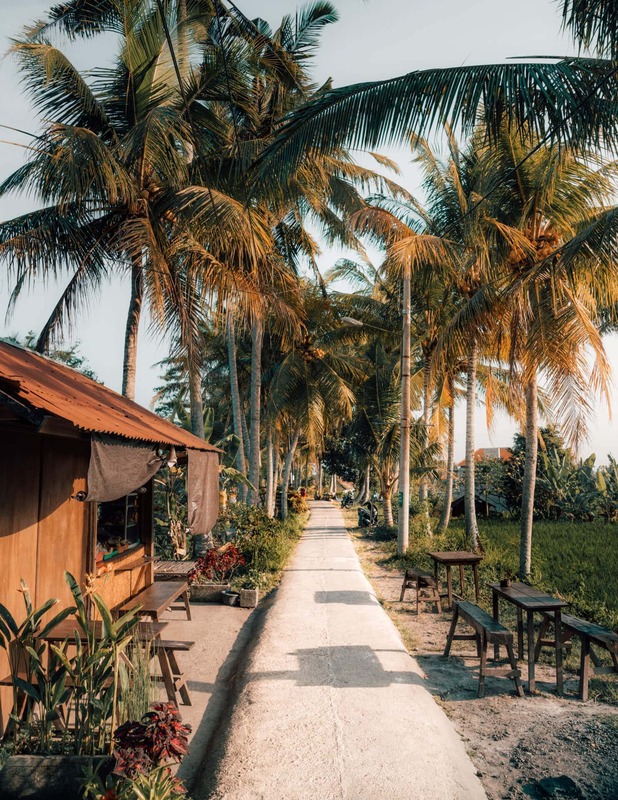 The area has become popular because of its surrounding rice fields like Tegalalang, countless waterfalls, yoga retreats or to hike up Mount Batur. 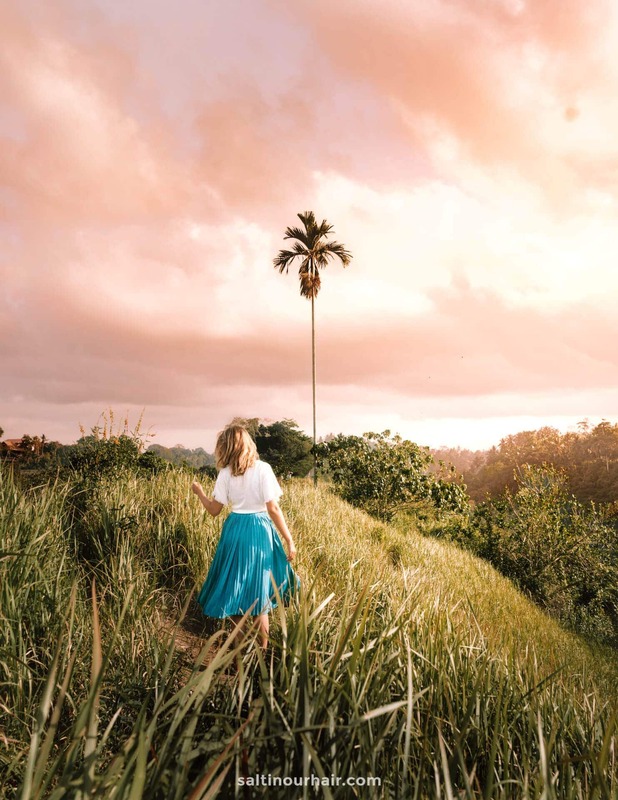 Everyone spends their time in Ubud differently. While one prefers to stay out of the city in a retreat other go restaurant hopping or explore its nature. 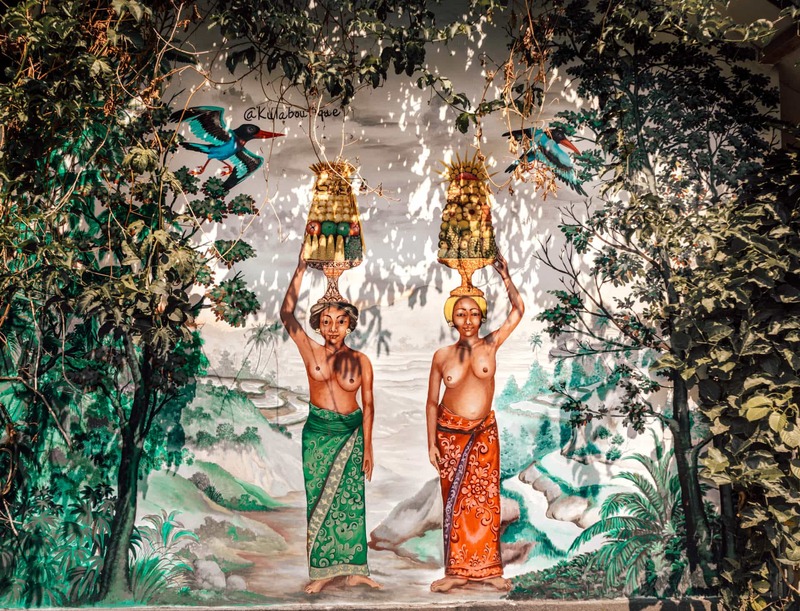 Find out about all the things to do in Ubud in this 3-day guide. 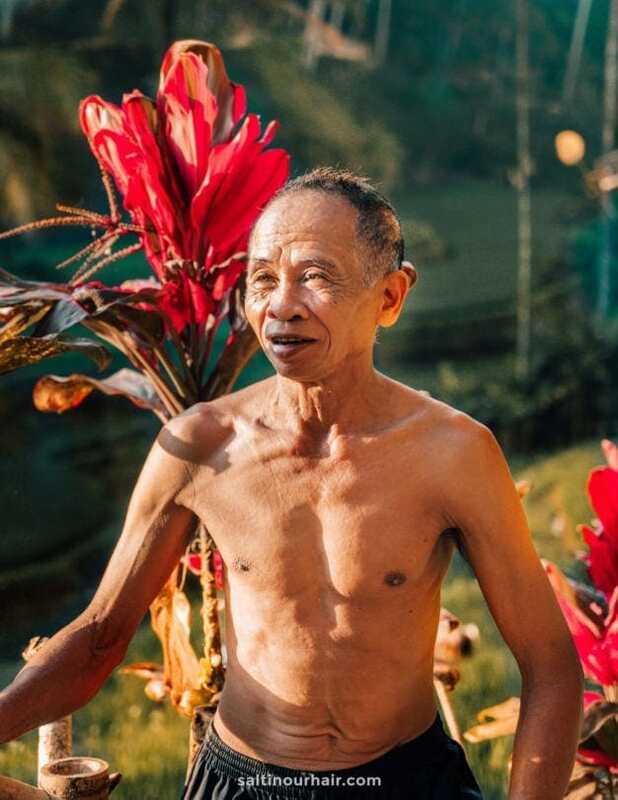 Getting around Ubud can be done by motorbike (experience drivers only) or private driver. 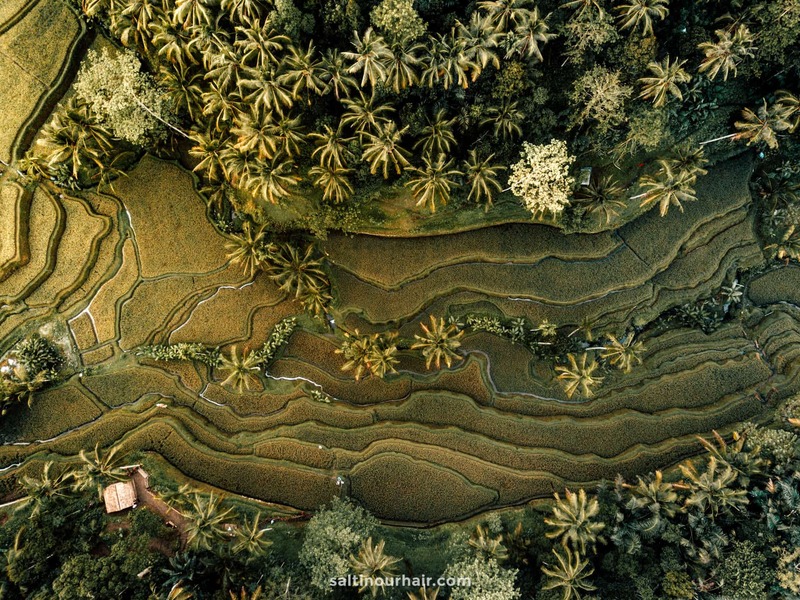 Ubud is the main destinations for a 3-week Bali Route and is busy year round. 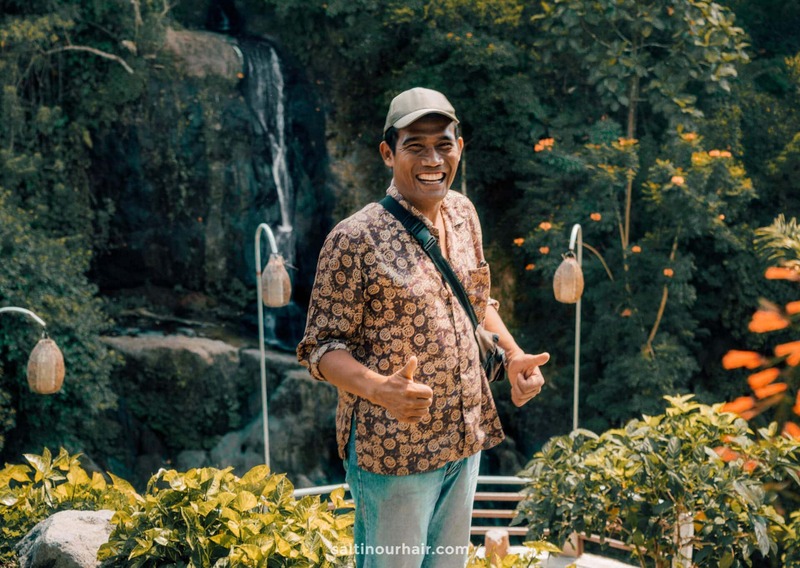 For that reason it is best to get a driver for the first and second day of this; things to do in Ubud guide. Rise and shine very early to visit the magical valley of rice terraces: Tegalalang. 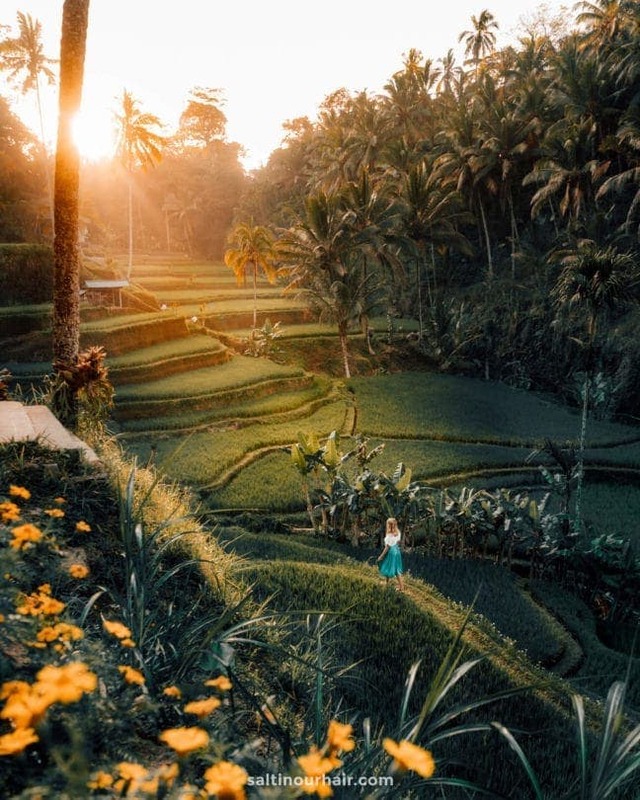 The countless layers of rice fields are the absolute best way to start your day in Ubud. Due to its popularity its best to visit the terraces before 10 AM to avoid the crowds. 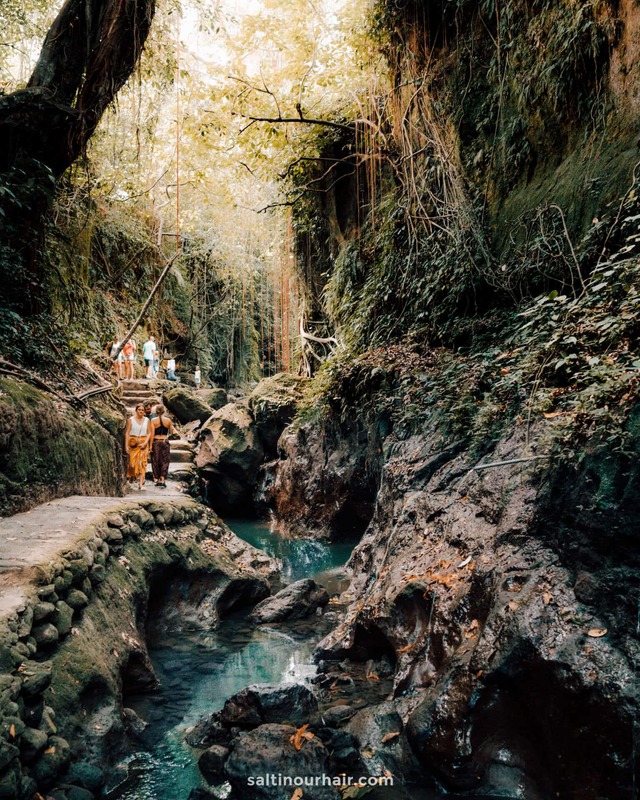 Visiting Tegalalang is one of the things you must do in Bali. 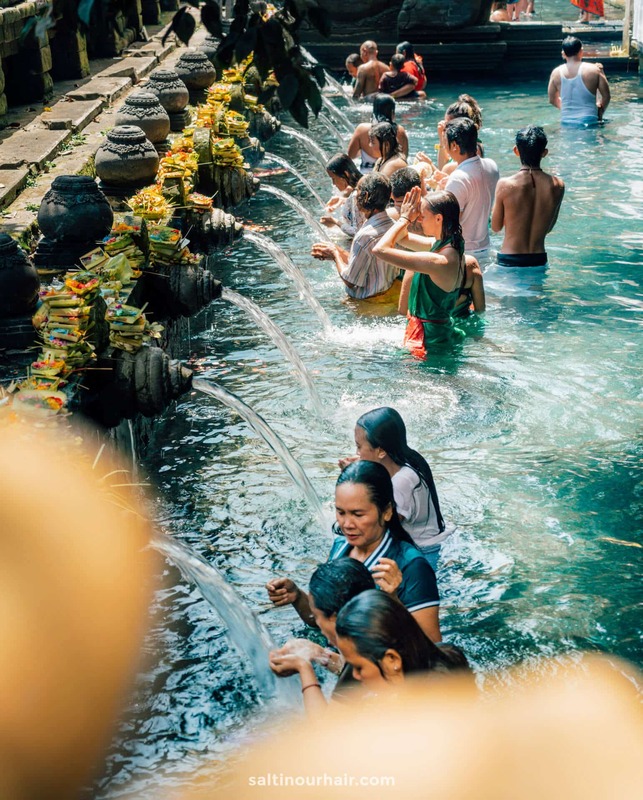 This temple is an important site for holy, fresh drinking water from the ground. 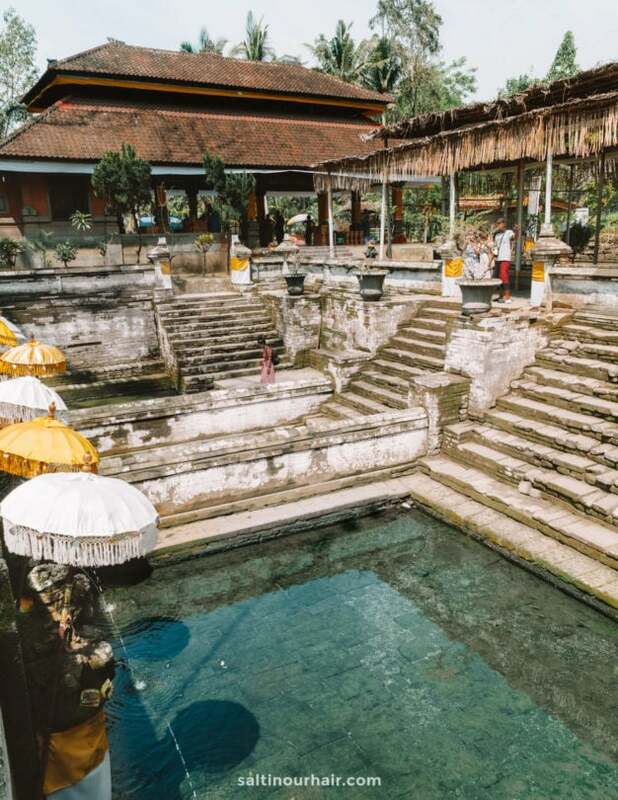 Both locals and tourists go into the two purification pools where you clean yourself at each of the 30 stations. The cleaning process starts from the left and finally finishes on the right side. The entrance is 15000 IDR per person. Tip: Nearly every temple provided free sarongs to use inside the temple. Pura Gunung Kawi is an archeological area in Bali. A long time ago big temples and houses were carved out of the rocks because people didn’t know how to construct houses. The whole area is surrounded by beautiful rice paddies. 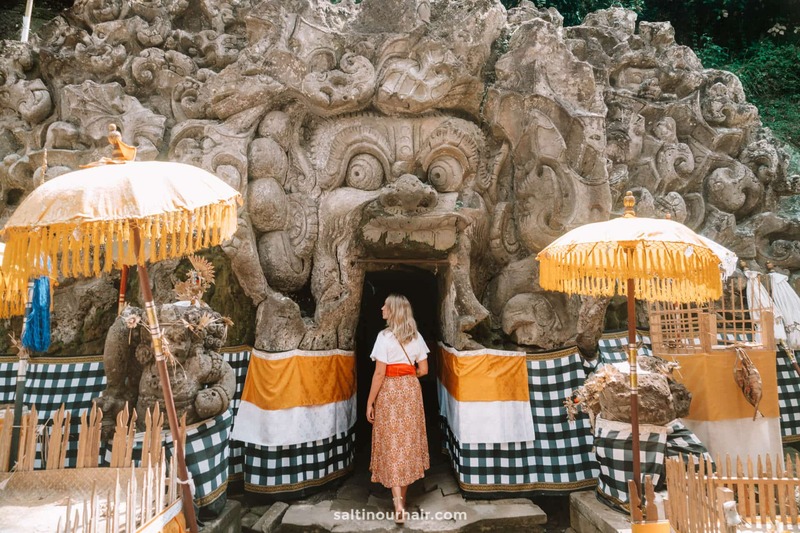 A highly recommended thing to do in Ubud! Again the entrance is 15000 IDR per person. Lunch tip: Have a great lunch at Lazy Cats Cafe. 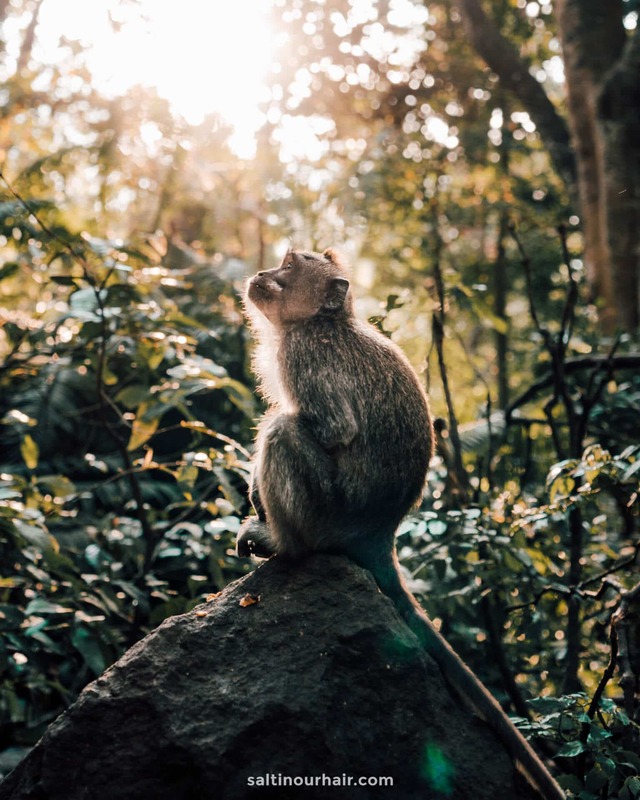 The monkeys are not really interested in you but remember that they are wild cheeky animals so the park asks you to stick to the following rules. Don’t smile, showing your teeth is a form of aggression. 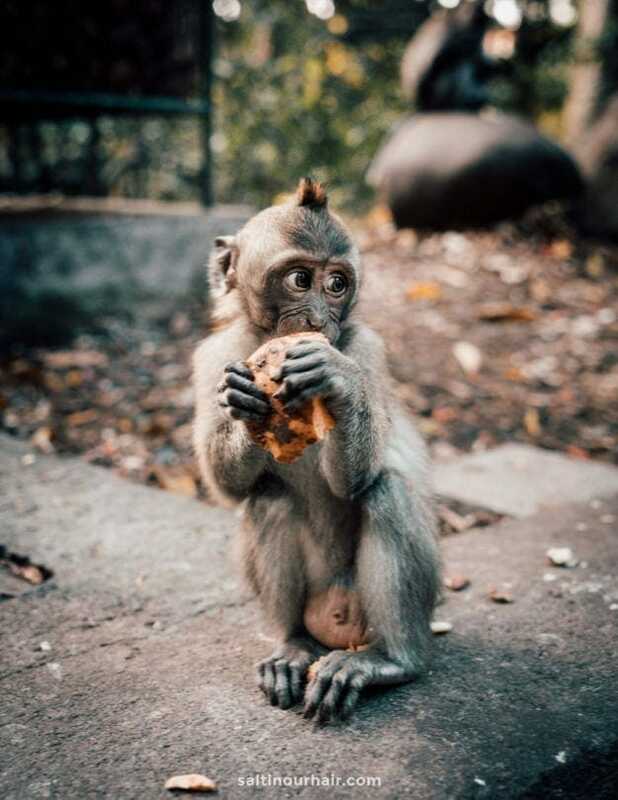 We think the Ubud Monkey Forest should be on everyone their 3-week Bali Route. The entrance fee is 50000 IDR and you can easily spend 2 hours here. Around sunset time, head to Campuhan, this is the bridge where the two rivers meet in central Ubud. 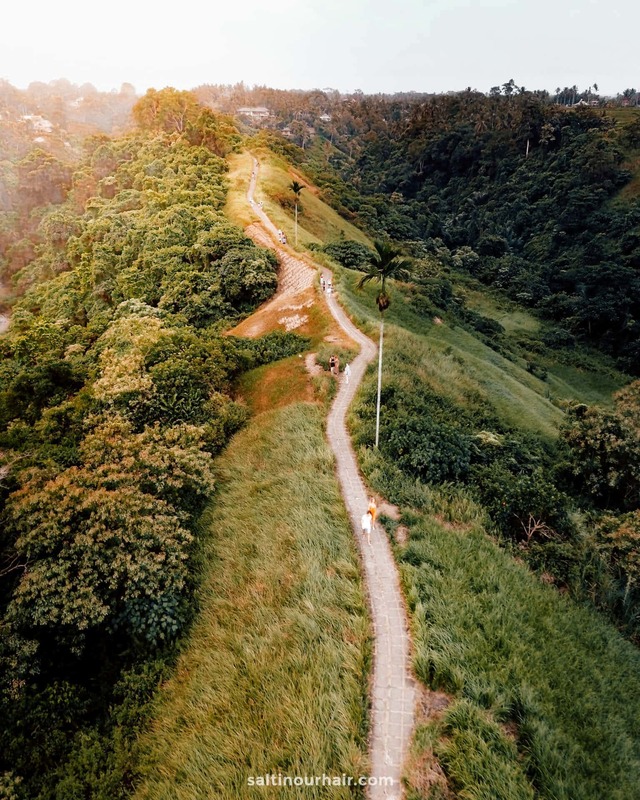 The 2-kilometer long Campuhan Ridge Walk is very popular with both locals and visitors. Some for a walk with their dog, for a good run or pretty pictures. It is free for everyone. After this walk you must be hungry. Go to KAFE for a delicious dinner. 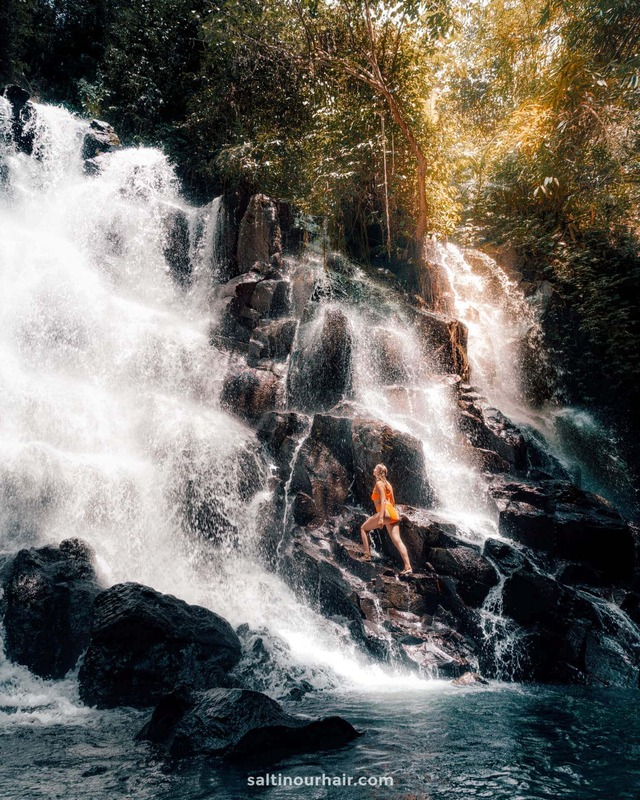 Ubud owns some of the most beautiful waterfalls in Bali. 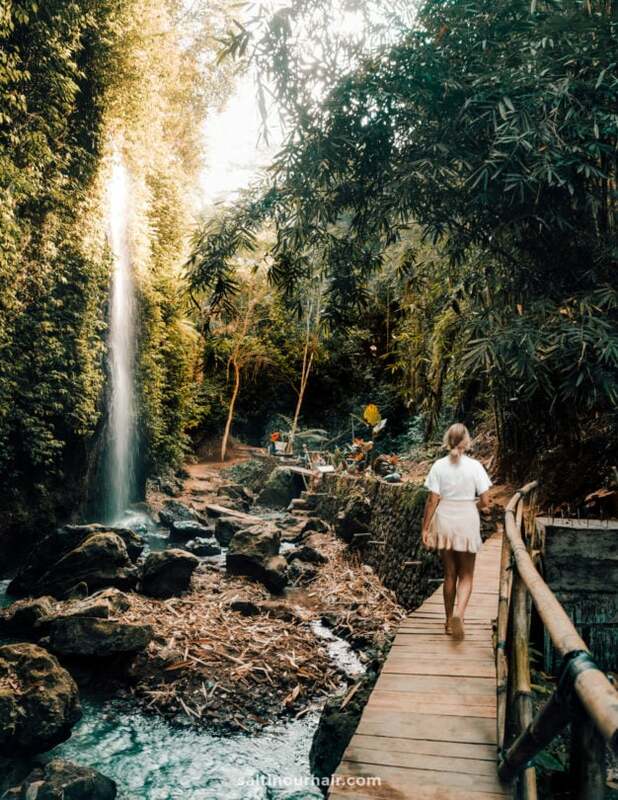 The following two waterfalls are 40 minutes outside of Ubud, easy to visit and lesser known than the other waterfalls in the area. The waterfall Kanto Lampo is a beautiful big wall of water which is popular to climb up. Locals like to hang around at the weekend. In front of the waterfall is a small pool area. Jump in the water, enjoy a relaxing swim and shower. It is a simple 3-minute walk down from the parking. Tip: Visit Kanto Lampo during the weekdays as many locals will be here in the weekend. 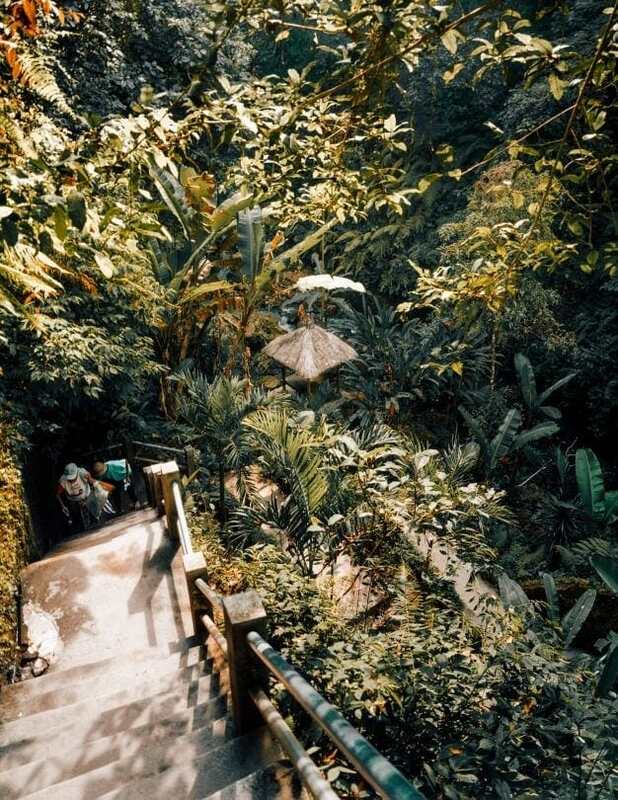 A short 15-minute ride from Kanto Lampo is the strong Tibumama waterfall. 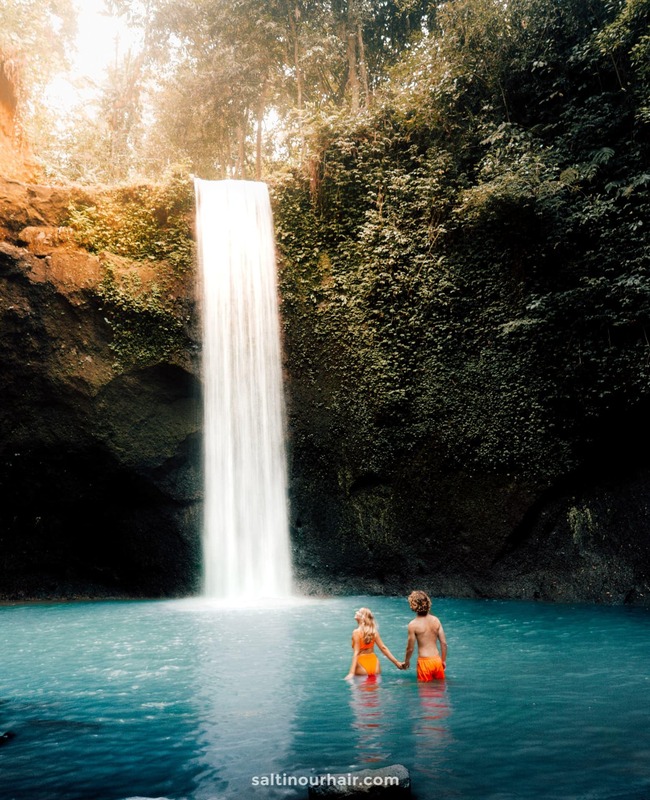 After an easy walk down you can have a swim in front of the waterfall. Be careful, the force of the falling water is usually very strong here. The entrance here is 10000 IDR. Or: Visit the very popular (read: busy) but impressive waterfall: Tegenungan. Located south. Don’t worry, no elephants and animal abuse here. 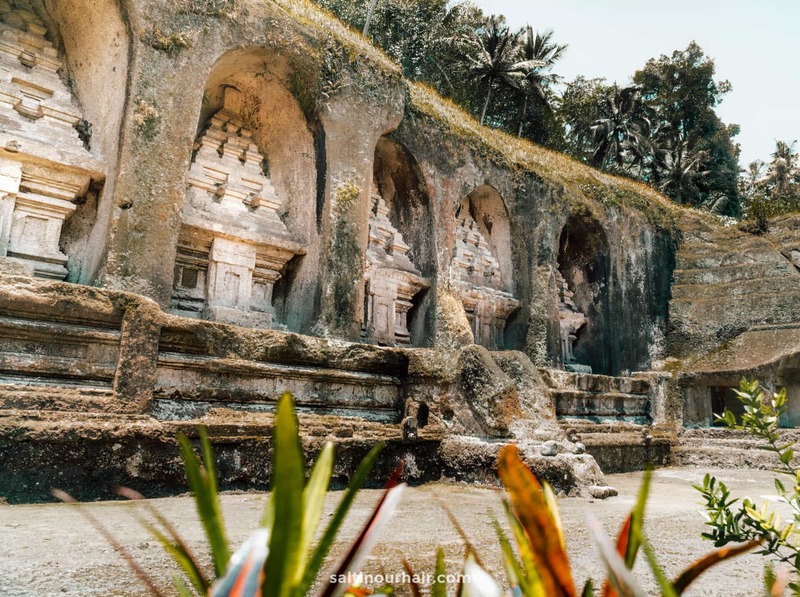 Just outside of Ubud is a meditantion cave carved out of the rock. It is a small temple and easily to visit. The entrace is 15000 IDR per person. Sarongs are for free near the ticket counter inside. 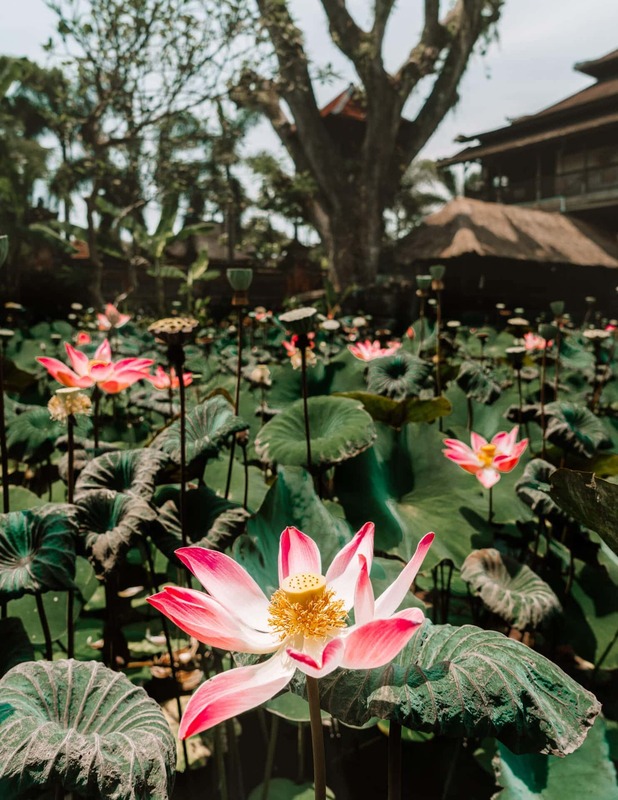 In the center of Ubud town is a temple surrounded with water and beautiful lotus water flowers. It is a bit hidden behind the starbucks and free to enter. At night, a dancing performance is held. Lunch tip: Warung Pondok Madu great indonesian food and service. Another good option is El Mexicano. 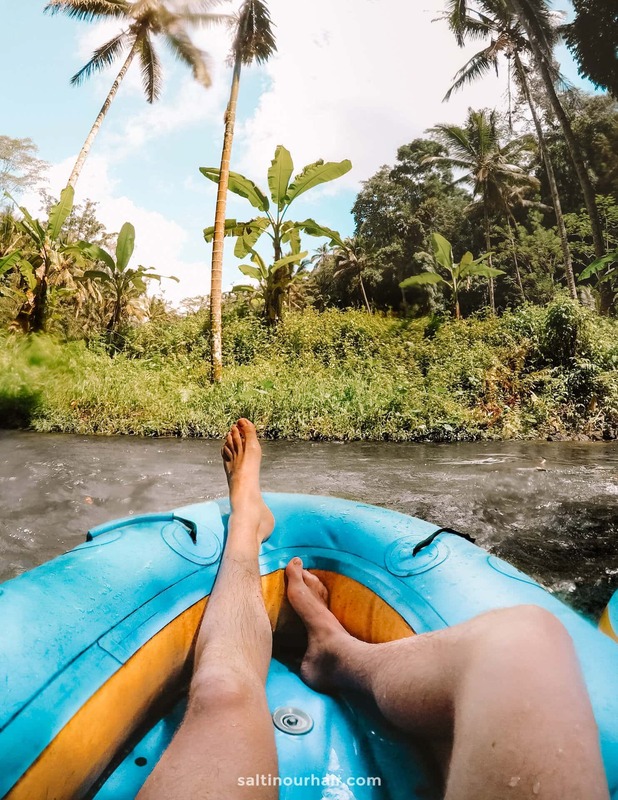 Tubing and White Water Rafting are two very popular things to do in Ubud. Either alone where you meet people or with a group, going down these rivers is a great and refreshing experience. We loved tubing with our friends. It usually takes from 8 AM to 1 PM. 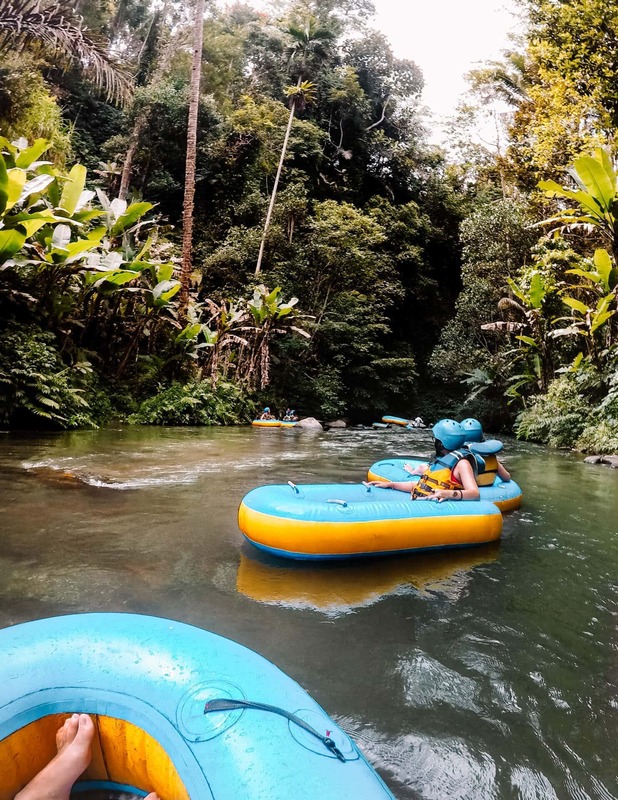 The price for tubing is 600000 IDR (40 USD) and rafting is 445000 IDR (30 USD). The more people, the cheaper of course. 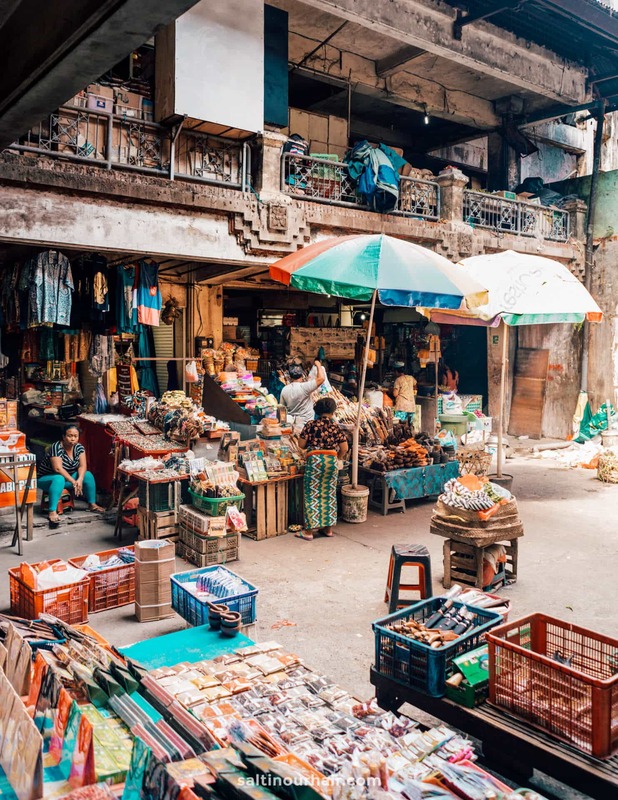 Every day in the center of town is the Ubud Market. It is split into two timetables. The traditional market where vegetables and meat is sold starts from 3 AM until 8 AM. At 9 AM, the market changes to the Art Market. Where they sell everything from handbags, kitchenware, decorations, paintings, souvenirs, you name it. 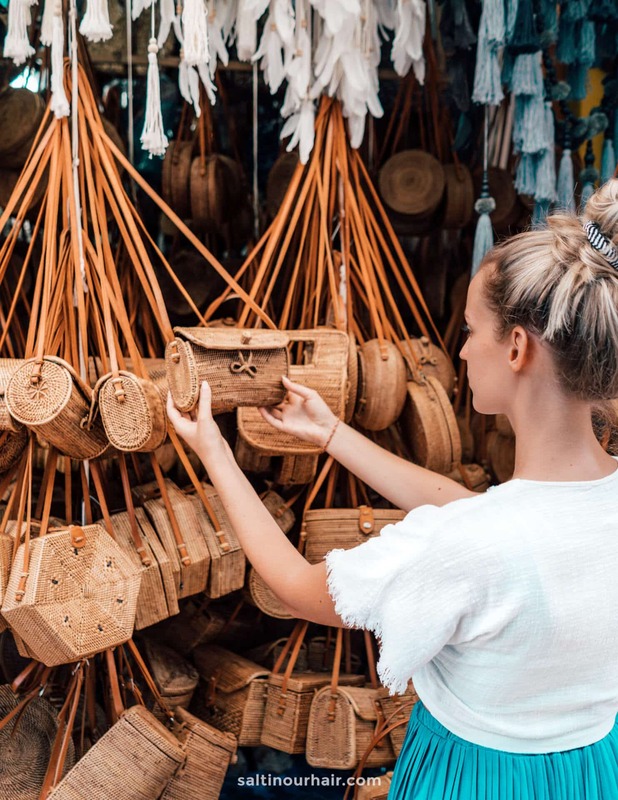 The Ubud bag became a worldwide fashion item, as a result, every shop sells these pretty bags. 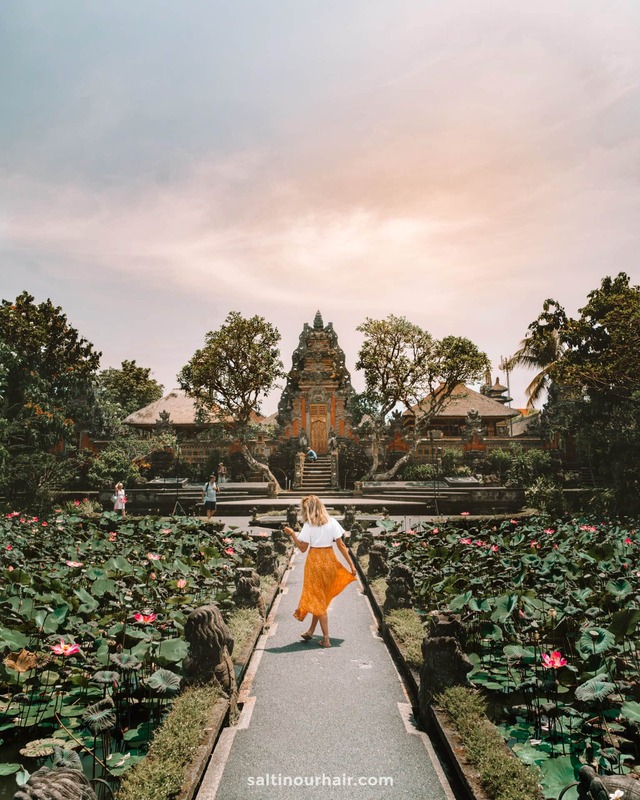 Above all, do not forget to spend time in Ubud! 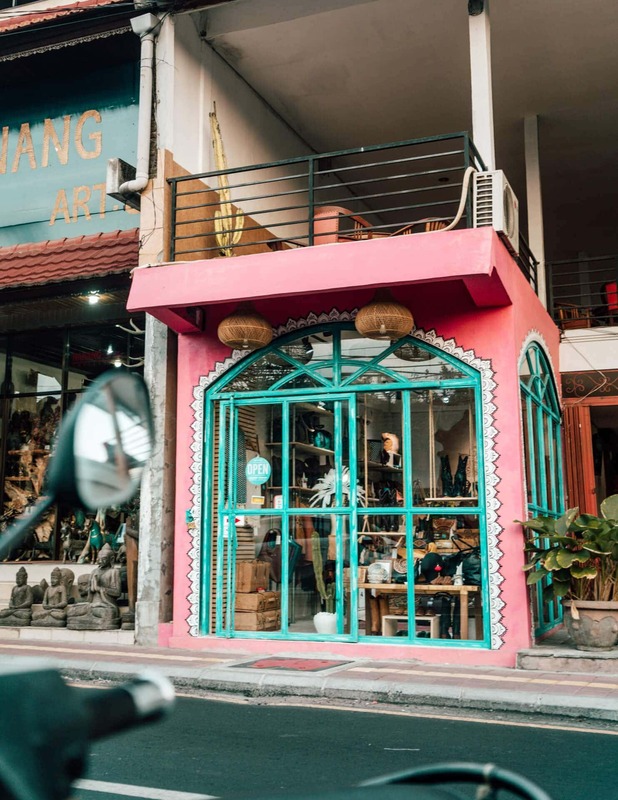 The town is great to walk around, small art boutiques, clothing shops, and delicious restaurants. 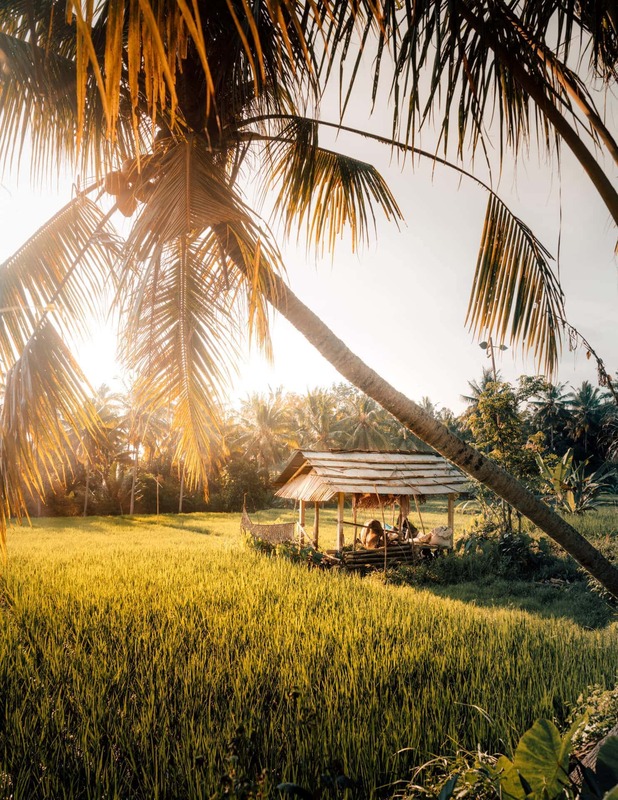 Certainly, one of the lesser known things to do in Ubud is the relaxing rice field walk. It is a 45-min walk over a pad along the beautiful fields and farms. It is unknown because the path is a bit hidden away although it is right in the center of town; this is the exact route. 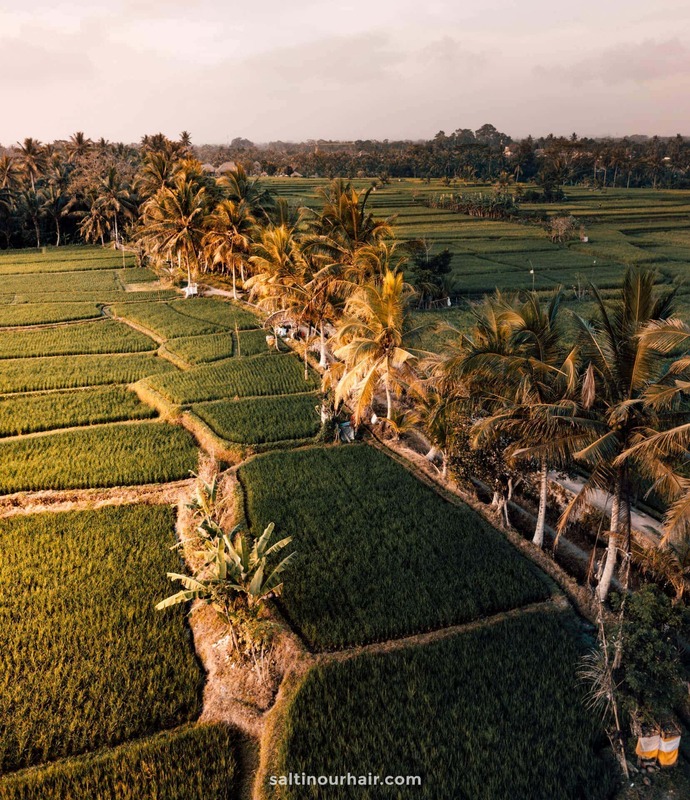 Finally, while you are on the Ubud rice fields walk, stop halfway at either Sari Organik or Sweet Orange Restaurant and have a delicious dinner during sunset surrounded by rice fields. Probably the best dinner location in Ubud! 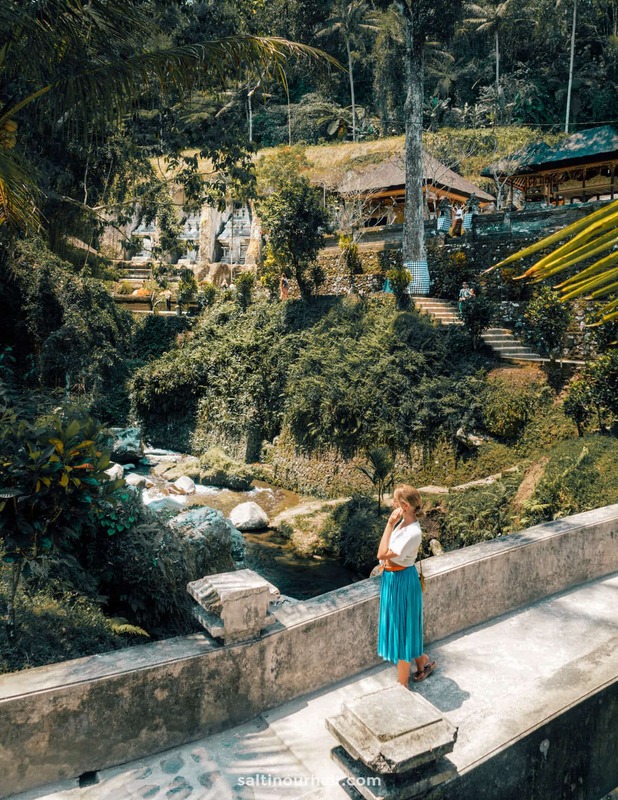 Weather-wise, Ubud can be visited best from June to September. Hot days and cooler nights which is very comfortable. 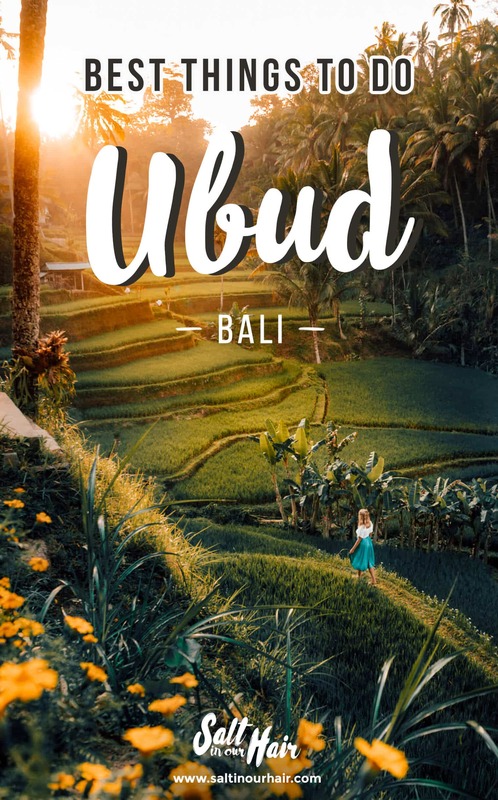 Ubud is good almost year round except for Bali rain season (December – February). 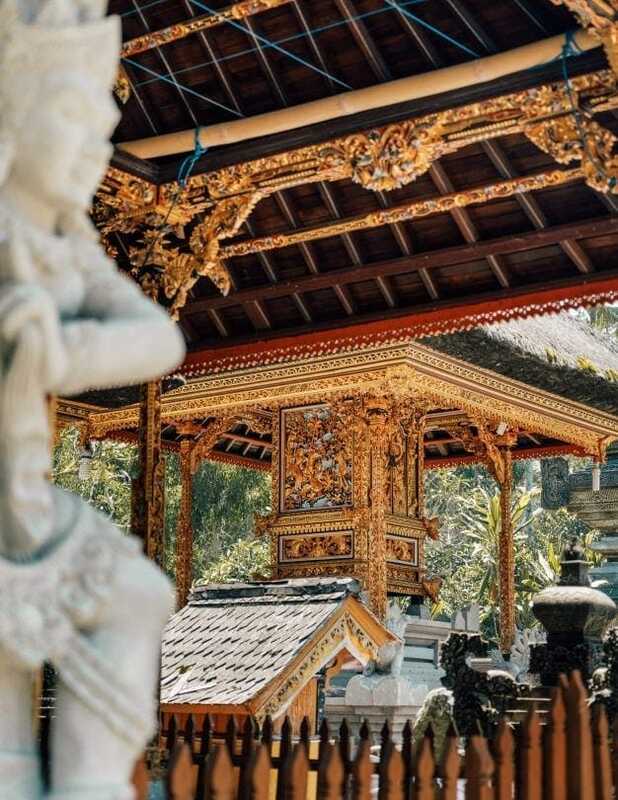 Ubud is a 1-hour drive from Denpasar airport. Roads are busy so it usually takes a little longer. Getting around on a motorbike is only advised for experienced drivers. 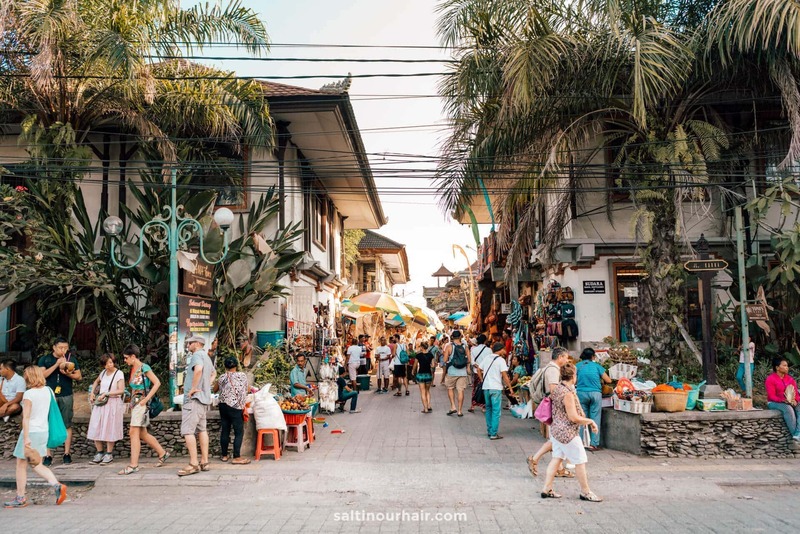 Ubud center has become so busy that a big part of the roads has become one way. 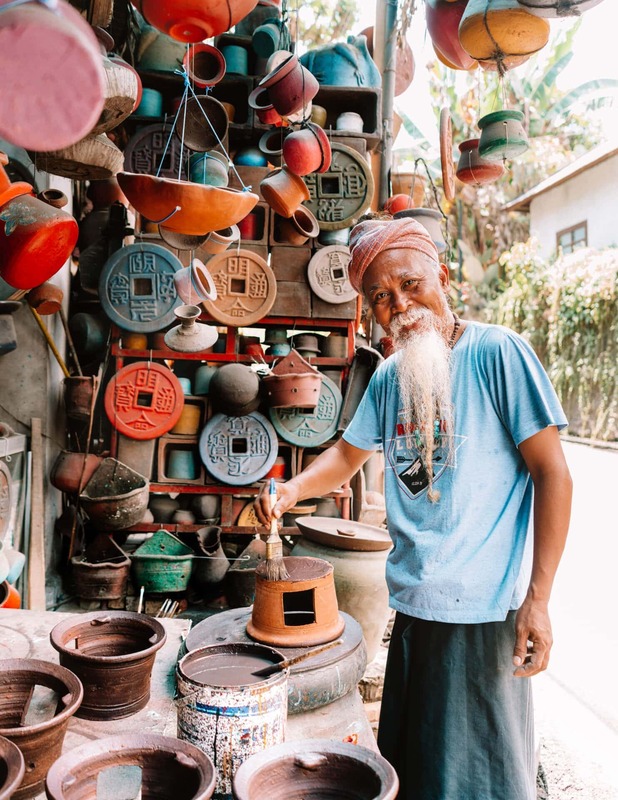 Driver recommendation: Contact our Balinese friend Yande and his team on Messenger. The surrounding rivers, rice field views, jungle vibes make it great to spend a longer amount of time. 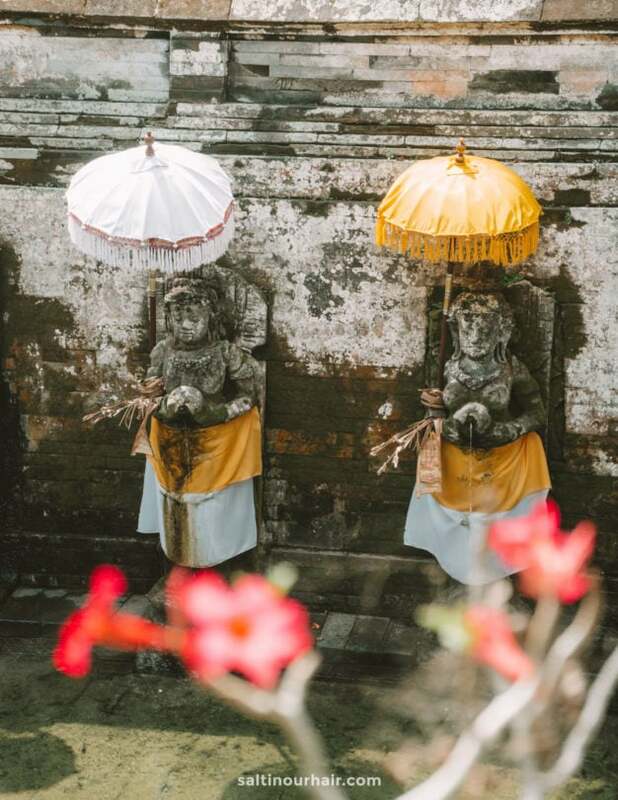 Therefore some of the most beautiful hotels in Bali are located in Ubud. 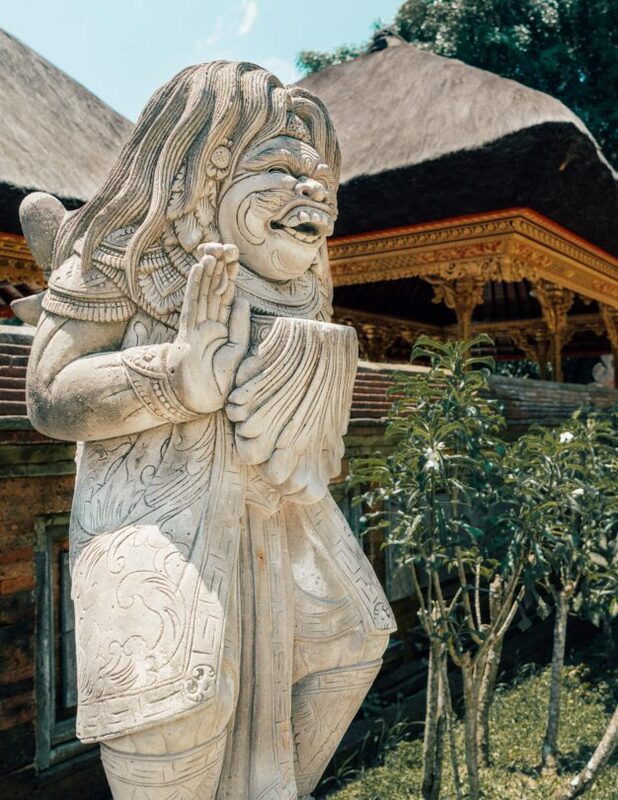 Ultimate Jungle Luxury at Maya Ubud. Luxury stay in the Jungle of Ubud. 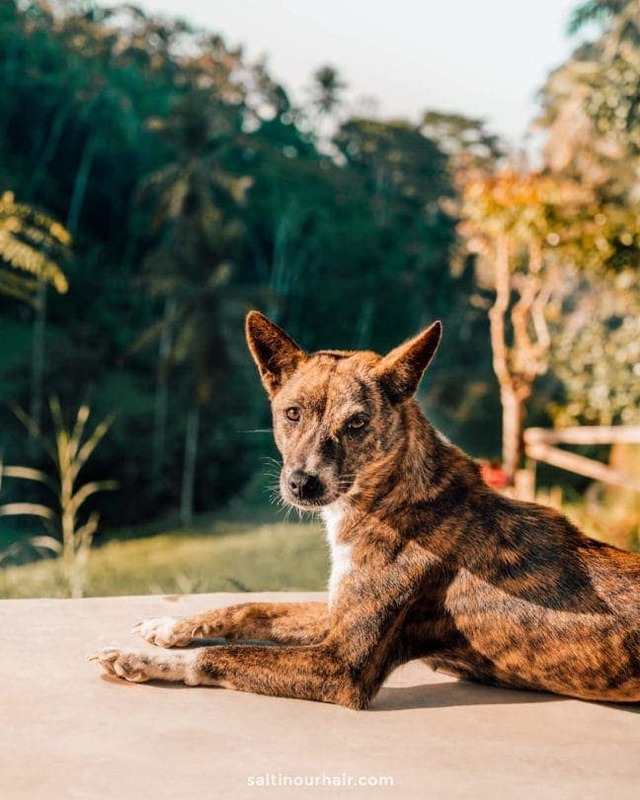 A homestay in Ubud for just $15 a night!